It's Friday the 13th today so I thought I'd dig up some pictures from the depths of my (mostly unused) photo archives, of kids on islands frolicking, not worrying about bad luck and superstition and generally having a blast. I actually didn't take the first and second photos - these two were snapped by my husband Josh Humbert who is much more of a pro at this photography stuff than me. 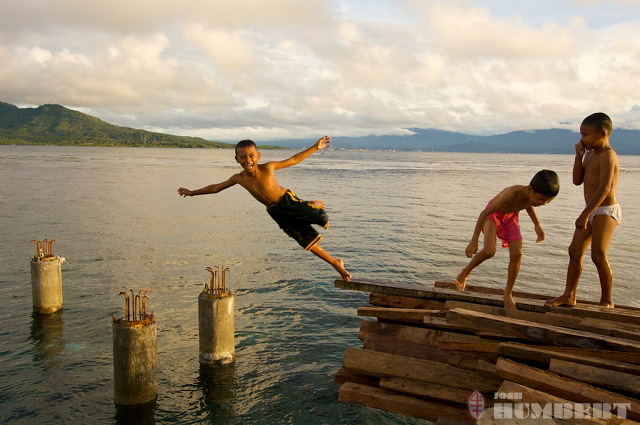 Both were taken on Bunaken Island off of Northern Sulawesi, Indonesia. I love that in the second one these kids look like they're about to land on a bunch of rebar - don't worry, they didn't. 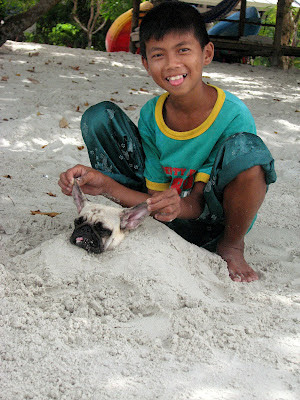 I took this next photo on Ko Phayam in Thailand in around 2008. I went back last year and this kid is now a great big tall man but I still recognized him. Unfortunately, I didn't see the dog. Hopefully the burying him in the sand thing didn't get out of hand. He told me at the time that the dog liked be buried because it kept him cool. 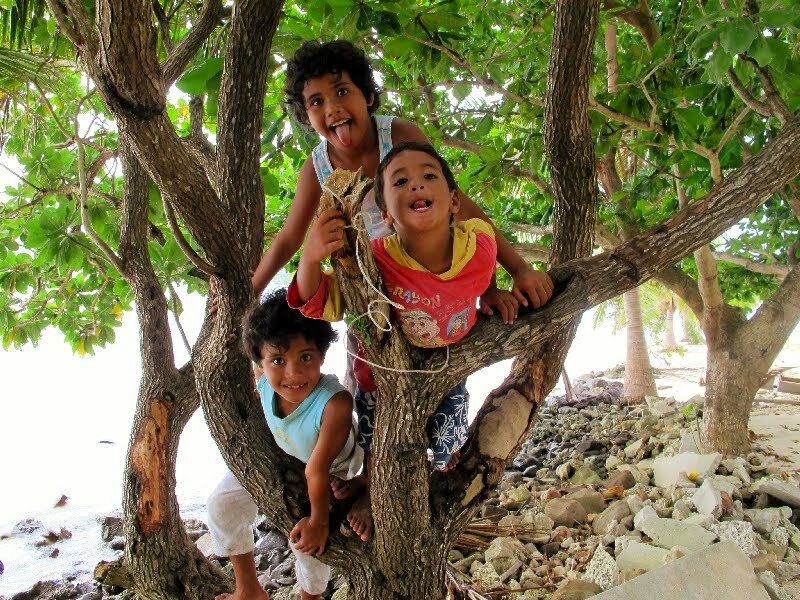 It was just me and these three kids hanging out on the wee island of Namu'a in Samoa for a few hours. We spent at least an hour of this taking silly pictures and after each one they'd shout "Wanna see! Wanna see!" I wore out my camera battery flipping through all of the pictures. It was really fun. 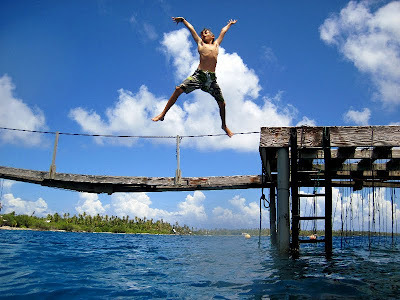 Here is my son gracefully leaping off the oyster platform at my family's pearl farm in Ahe, French Polynesia. Speaking of kids growing into big tall men, this was taken a little over a year ago and now he's my height. You may remember this scene from another post a few weeks ago. 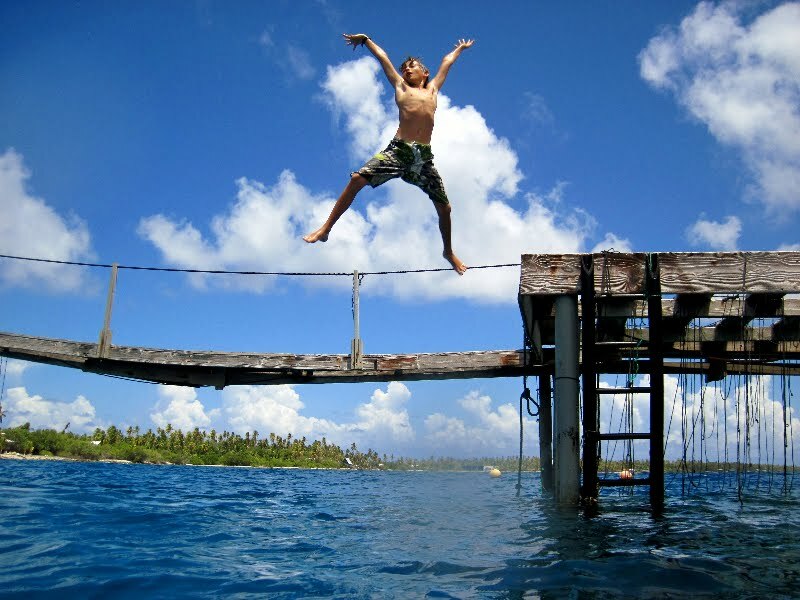 These boys in American Samoa were leaping into this pit of spiky lava with a huge and powerful swell heaving in and out of it. Danger was everywhere but they couldn't have given a flying and of course no one got hurt. And last, I love this boy. What a character and I hope you can tell from this photo. 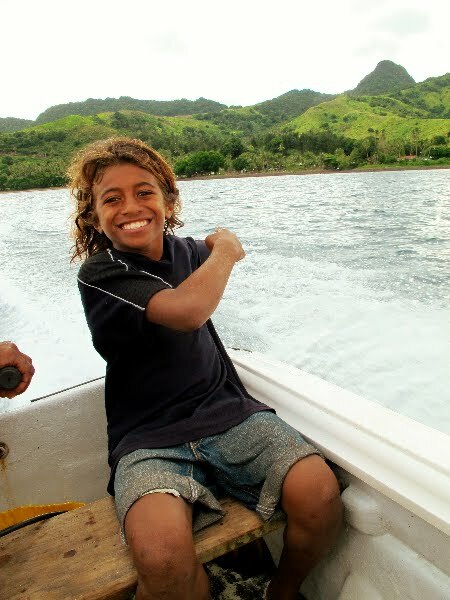 This is in Ovalau, Fiji. 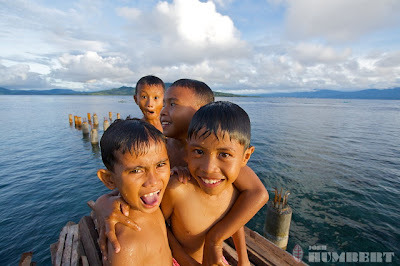 I stayed in a homestay and "Billy Boy," besides cracking jokes and constantly getting into trouble also knew how to drive the boat, fix the motor, cook, clean and sing loud and clear at church. He's a great kid. He's 12 years old. Put your life into a life . . and live!!! Hello! My first visit, will visit you again. Seriously, I thoroughly enjoyed your posts( really interesting blog). Congrats! Would be great if you could visit also mine... I wish you a wonderful day with very smiles and peace. Thanks for sharing! Hi, I'm a Cuban I live in Galicia, I came to your blog through Blogspot Directory and I am glad to find you. You Have a lovely blog, full of unimaginable tenderness. I think I will visit every evening. I like to know the life of other distant countries.